The hippopotamus is an extremely difficult animal to photograph in a way that is either different from the generic “mouth open” offerings, or in a way that truly portrays an adult’s bulk and menace. They are extremely dangerous animals and it is foolhardy to get too close. This is as close as I ever want to come to a protective adult – particularly when I am in the water. 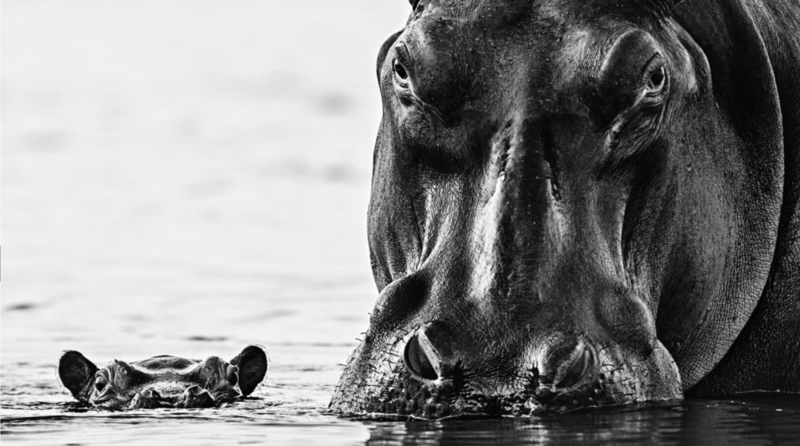 Hippos kill 3,000 people a year in Africa. There is a haunting intensity to this image – and it has an almost hypnotic pull that draws our eyes back time and time again to the adult’s eyes. Her eyes convey many emotions – protection, anger and alertness, whilst I am sure my eyes at the time just conveyed fear. She probably weighed the same as 20 adult men combined. The baby hippo also offers great context to the enormity of an adult’s face. The early morning light and the adult’s wet face combine to offer detail on a facial bone structure that is bordering on prehistoric and quite without equal. I am so proud of this picture, which was taken just 20 minutes before I had to leave the Zambezi to find my way home. The previous few days had yielded nothing.